There is a Thai takeout place near us that has the best dumpling appetizer. The dough is soft and stretchy, packed with perfectly seasoned greens and served with a beautifully spicy soy-ginger sauce. 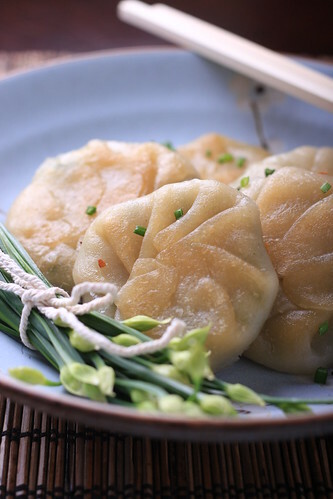 Because I’ve made my own dumpling wrappers before and love the meditative and repetitive process involved, I decided to try to make these supple and gorgeous dumplings myself this weekend. To replicate them, I pulled some steps from this recipe and method as well as this one, and the end result was pretty close to the takeout version. The trick here is to use parchment paper to sandwich the dough in while rolling them out into the thinnest shape possible—it prevents sticking and helps to produce a perfect vessel for stuffing the garlic and sesame seasoned chives into. Place all of the wrapper ingredients, except for the boiling broth, into a Kitchen-Aid mixer. Attach the flat beater and mix on low for a few seconds to combine. Heat the broth in the microwave until it comes to a boil and then add it to the mixture and knead at a high setting for several minutes, until the dough is soft and pliable. Roll the dough into one large ball, then separate them into four small balls. Roll each ball into a cylinder shape, about six inches long. Place three of them onto a greased plate and cover with saran wrap while you make the first four wrappers. Divide the cylinder into four equal pieces. Take one piece in your hand and mold it into a flat circular shape. Place it in between two sheets of parchment paper, then use a mini roller to get them as thin as possible. They don’t need to be a perfect circle. Place the finished wrappers under the saran wrap while you make the rest of the wrappers. Heat the sesame oil over medium low heat, then add in the garlic and chopped chives. Gently saute for about 3 minutes, stirring frequently to ensure the garlic doesn’t burn. Remove from the pan to cool and set aside. Combining all of the sauce ingredients together. Set aside. Place a small amount of the filling into the center of one of the wrappers. Pull one side up to the center and continue with all sides to make a nice scalloped shape, then flatten them out between the palms of your hand. They don’t need to look perfect. Heat about a tablespoon of vegetable oil in a large saute pan over medium-high heat. Once the oil starts smoking, place as many dumplings as you can in the pan without having any of them too close or touching each other. Sear for about 3-4 minutes on each side, or until the bottom is nicely browned. Now add about 1/4 to 1/2 cup water into the pan. Be really careful, because the water will sputter. Quickly cover the pan with a tight lid and reduce the heat to low. Let it steam for about 5 minutes. Remove the lid, flip the dumplings and dial the heat back up to medium and saute until the water has all evaporated. Repeat these steps until all of the dumplings have been fried, then serve immediately with the ginger dipping sauce and garnish with the reserved flowering chive tips. Oh boy do these look good!! Question: is wheat starch the same as vital wheat gluten? Thanks Lauren! No, VWG and wheat starch are very different. Vital wheat gluten has had all of the starch washed off of it, leaving only the tough and stretchy protein part behind. It's good for seitan-making, but not for this application. You'll want the light and carby part of the wheat to make the dumplings soft and delicate. Good luck! Thank you so much! =) Can't wait to try them! goodness, this looks lovely, tho so labor intensive! just filling wontons can be time consuming, i can't imagine actually making the wrappers themselves too. i love me some chive blossoms, too. They look delicious. How long is your delivery time? Amazing! What care and thought goes into making these! Do you think I could replace the wheat starch with a combination of other starches for a gluten free wonton? oh my gosh, YUM! that looks so delicious! i love the flavor combo! lovely! i've made my own wrappers before too, but yours look better. thanks for the recipe! I am so excited to make my own wrappers. Dumplings are so comforting to eat and I love the Asian flavors. All the links are really helpful. Thank you! Will check out your site. Congrats on your launch! These look amazing! I can't believe I've never seen your site before. I'm in love. I read through and might have missed it, how many servings/dumplings does this make? I'm so excited to make these!